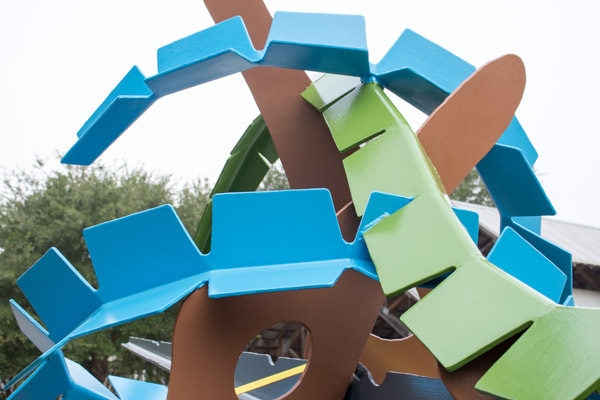 To create this sculpture, Manson was inspired by history, nature and the region’s geography. He used traces of shapes found in a local live oak tree, a Simmons Sea-Skiff boat, maps of New Hanover County and industrial gears. The negative space within the forms of Traces connect through the sculpture to its concrete base, alluding to a ghost forest. Tapered forms ascend, spiral and grow denoting time. South Carolina artist Joey Manson is a senior lecturer at Clemson University. He earned a master of fine arts degree from Alfred University and a bachelor of fine arts degree from Clemson University. Manson works with industrial materials to depict his surroundings, abstracting technological and natural environments. View a time lapse video of the sculpture installation.